It is Hump Day (i.e., Wednesday). So, besides using the Paint program on my computer to draw the amateurish illustrative you see above, I have also compiled a creative collection of encouraging encouragers which may help heave your heavy heart over Hump Hill. At least it’s not Tuesday. Going uphill works muscles you use all the time; going downhill works the other ones. Oh, Monday is now two days in the past! Wednesday night is prayer night at many churches. That means tonight you can finally vent and feel spiritual at the same time. If you’re reading this that means your power hasn’t been shut off. Yay for you! People don’t like you? That’s OK! The people still liked Jesus on Wednesday, and look what happened to Him by the time Friday rolled around. It’s Wednesday, but it could be worse. If you like Wednesdays, it’s only 7 days (or 6, depending on your time zone) till the next one! Yippee! Unless you’re using it as a metaphor for impending doom, or unless you’re brakes have failed, you just fixed your hair, or there’s a swarm of bees ahead, going down hill can be fun! It’s easier to coast on a bicycle and yell “Look Ma! No hands!” when you’re going down a hill. Take advantage of the week winding down to lift your hands in praise! …Just be careful when you’re tempted to say: “Look at me!” Pride (and stupidity) often precedes a fall…that’ll ruin the rest of the week. And lastly… Sunday is that much closer! Hallelujah!! So, HAPPY HUMP DAY! At least it’s not called “lump day,” right? Every once in a while I try to share some down-to-earth insight into the pastorate, or ministry in general. Granted, my perspective is limited, being I have only pastored smaller, bi-vocational churches; therefore, I can’t speak for all my brothers who lead larger congregations (200+). However, some things are pretty consistent with those who regularly stand behind the pulpit (or beside a table, if that’s your thing). Many of the stresses are similar, as well as the spiritual battles we must fight. Whether the battlefield be small or large, our weaponry and armor are the same (Ephesians 6:10-18), and so is our adversary (1 Peter 5:8). Therefore, all things being equal as possible, I believe Sunday nights – not Saturday nights or Mondays – are the worst times of the week for a pastor. The following are two excellent reasons why I feel this way. Any pastor who cares about his preaching ministry will concern himself, to one degree or another, with the proper exposition and delivery of his sermon. But if he gets no “amen’s,” sees no conversions, rededications, or even a few approving nods, it’s not going to be long before the poor man will question his abilities, maybe even his calling. A lack of visible response can take the wind right out of a preacher’s sails. Seriously, stop and think about it. If you were to build a small, wooden toy, you could hold it in your hands when finished, admire it, nod with approval, and say to yourself, “Good job! Well done!” Clean a dirty kitchen and how do you feel? A sense of satisfaction, correct? But when a pastor is done preaching, more often than not there is nothing tangible to show for it, especially if there is little feedback; the “well done” will have to wait till later. So, since the “job” is never done, and much of the fruit of a man’s labor won’t be recognized until eternity, it’s easy to be critical of one’s self. Sunday nights are when we can be the most critical. Secondly, a pastor expends a lot of mental and spiritual energy over the weekend, especially if he works another job during the week and preaches more than one sermon on Sunday. Believe it or not, some pastors (especially bi-vocational ones like myself) never – yes, I said “never” – get a day off. By the time Sunday night rolls around, you’re looking at a physically and spiritually drained individual, and Satan knows it. Therefore, because our enemy is not stupid, he knows the best time to attack us, and that’s when we are tired and vulnerable. He is far less likely to defeat a man of God while he’s charging into battle or waging a righteous war against the forces of darkness; it’s when he’s coming down from a spiritual high, or when he’s depressed and down over a perceived failure behind the pulpit, that the preacher’s at risk. No, our Enemy is sneaky and stealthy; he lurks in the shadows, waiting for just the right moment when our guard is down and our frailties are exposed. So why do I share this? Not for your sympathy or pity, that’s for sure. As the lyrics of a song go, “It’s a battlefield, brother, not a recreation room…It’s a fight and not a game,” so I am well aware of what I’ve gotten myself into (or, rather, what I’ve been called to do). The reason I share this is to encourage you to pray for your pastor…especially when the church services are over…when he’s tired…when the Enemy is most lethal. Don’t wait until Sunday morning to pray for your pastor and his family. Don’t wait until Saturday night to say a quick prayer that he’ll do “a good job” the next morning. Start right now! Pray! Interceed for your spiritual leaders, for they watch for your souls and must give an account (Hebrews 13:17). Their challenges are unique, and the consequences of failure can be far-reaching and eternally catastrophic. Please forgive me if there are any grammatical or spelling errors in this post, but I am talking into my iPhone as I’m walking around in the rain (The seven can handle that kind of stuff, thankfully), waiting while a bus driver trainee is taking his test at the DMV. I had to bring a school bus down for him to test own, so I’m on the clock and writing a post at the same time. What do you think about that? Anyway, today is the day after Father’s Day, and I wanted to share with you a thought or two that I had as I was standing in the rain. Yesterday was a wonderful day, and I enjoyed preaching a great message that was very convicting for all men present, including myself. And I also enjoyed spending time with my daughters who I love very much. One of our daughters lives in Charleston South Carolina, so she’s not able to be here. But the other two were in church with me yesterday, and then later for a lunch which a church member graciously provided the money for. Last night we ate dinner at home, late, and that is when my two younger girls gave me the presents that they purchased (with their own money!). I have included a picture below. 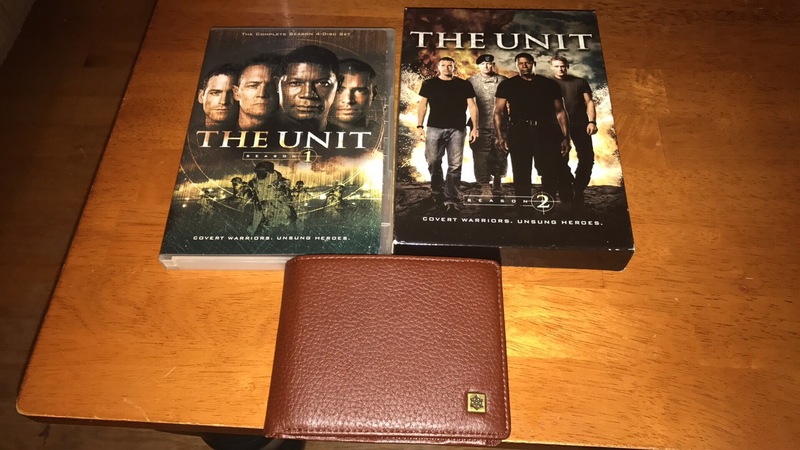 My youngest daughter, Haley, procured for me the complete box sets of the first two seasons of the television program called “The Unit.” And by the way, that was a fantastic series of which I think they should have never canceled. The other daughter, Katie, brought back something very unique from Norway. She found a wallet made from the skin of the Nordic moose! I don’t know how much she paid for it, but I know it had to cost more than something I would’ve gotten at Walmart. This morning as I was thinking about the gifts my daughters got me, and the question Haley asked, I couldn’t help but be reminded of Cain and Abel. I couldn’t help but think of Sunday morning and our worship. I couldn’t help but think of how so often we wonder if God loves us more or less than someone else, simply because of what we have to offer. I thought about what it must be like to be God the Father – our Abba – after a Sunday has passed. One of those gifts cost a lot of money (relatively speaking), while the others probably cost a lot less. However, based on the means of each daughter, both were a sacrifice. In the same way, when we go to church to worship God, the gifts and offerings we bring may cost one person a lot more than it cost another. But who are we to judge whether or not those gifts that were given were sacrificial? We don’t know the heart of the child, nor do we know the heart of the Father. All we can surely know is that if the gifts were given out of love, then they are of equal value. More so, if the Father truly loves his children, which He does, there’s nothing that can compare to those gifts given by the children who love Him. So, in conclusion, this is not only the day after Father’s Day, this is the day after Sunday. What gifts of love did you give your Father in heaven yesterday? I have no doubt they are giving him a smile today. Here’s another insightful guest post. I’m so glad God loves me, flaws and all! “Duh!” “How Stupid!” “Dummy!” These words are the words that fly through my head when I’ve made a silly mistake. I would never, ever talk to anyone else that way, but, for whatever reason, I feel quite free to berate myself soundly at any time or at any place. I simply cannot cut myself any slack – especially when I goof. I would really like to blame my upbringing. Maybe my parents are the ones who turned this horrible voice on inside my head. No, it wasn’t them. They tried their very best to make me feel good about myself. This voice is one I developed all by myself! “She’s just being kind.” These are the words in my head when someone pays me a compliment. If someone says my hair looks nice, I run to the bathroom mirror to try to figure out what my hair has done with itself since I sprayed it this morning – didn’t look so hot to me then. I love compliments, don’t get me wrong―it’s just that even if I was tempted to believe them, I probably couldn’t see what was worth complimenting. I mean really, my hair looks nice – um – must be something wrong with her eyesight! We’ve all probably heard that it takes 10 positives to outweigh one negative. I believe it. If ten people complimented me on my appearance and one person looked straight into my eyes and said, “You look tired. Are you feeling okay?”, I would run to the mirror to check out the tired eyes. I don’t think I’m the only person in the world who looks for the flaws instead of the attributes when I’m evaluating myself. I’m trying to figure out how to stop it before it gets way too far out of hand. The first step for me is to remember, “God didn’t make any junk.” I’ve always known that’s true, especially when I look at my husband or my sons and their families. They are absolutely wonderful people and I’m so very proud of them. I need to remind myself that God created me, too. He loves me, even though I’m flawed. The next step for me is to be as kind and gentle with my words to myself as I am to others. Have you ever tried to list five good qualities about yourself? I could list many more than that for the other people in my life, but to find five really good qualities about myself is a bit of a stretch. I’ll need to work on that. The best step I can take is to trust that God has a plan for my life. He put me here for a reason or reasons that I may, or may not, get to know. If I stay focused on Him and His goodness, I won’t have too much time to worry about myself and my flaws. The final step is to realize that the Bible is very plain about loving others as we love ourselves. Well, guess what? If I don’t have a healthy self-esteem, if I don’t value myself, how will I be able to value others? If I’m always looking inward at myself, how will I be able to hold my head high, look into the faces of the people God sends my way, and share with them all the love God has shared with me? So, for today, my plan is to prayerfully focus on God and His mercy, treating each of His children, even myself, with the love He expects us to show. A few years ago (2013) I received a note in the mail from one of my congregation. It was such an encouragement that I wanted to share it with all of you. You and our family are such a blessing to me. Wednesday p.m. service was a comfort to me and I know from what three other people shared it was a comforting message they needed to hear, too. I seems when you are most broken, weary, discouraged, Jesus and the Word pour through you in a powerful way, and we are touched. Your prayer was like a shepherd interceding for his sheep. Thank you for always being so sensitive to the Holy Spirit. I am blessed to sit under a man of God who teaches and preaches the true Word of God. Send your pastor a note of encouragement. I know he will appreciate it.